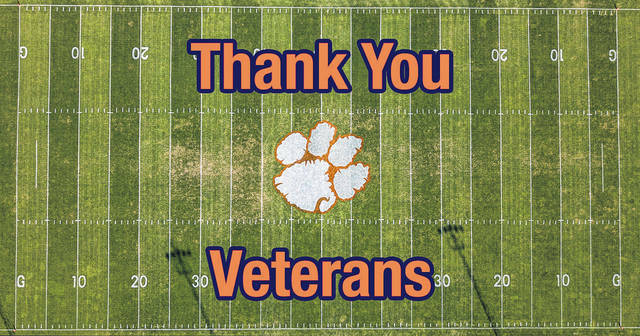 GALION — The Galion Athletic Department invites all area veterans to the Tigers’ football game against Marion Harding on Friday, Sept. 28, for a special recognition ceremony. All veterans and one guest will receive free admission to the game. The ceremony will include all veterans in attendance being recognized prior to kickoff. Each will receive a pass from the Galion Athletic Booster Club for use at the concession stand. Veterans are asked to enter the stadium through the pass gate. All honorees are invited to meet at the flag pole at the south end of the stadium at 6:30 p.m. to help honor our great flag. Please contact Kyle Baughn at 419-468-6500 for additional details about this special evening of recognition.